I dug out some old hand-drawn illustrations I did ages ago and arranged them into little tattoos for Easter eggs. 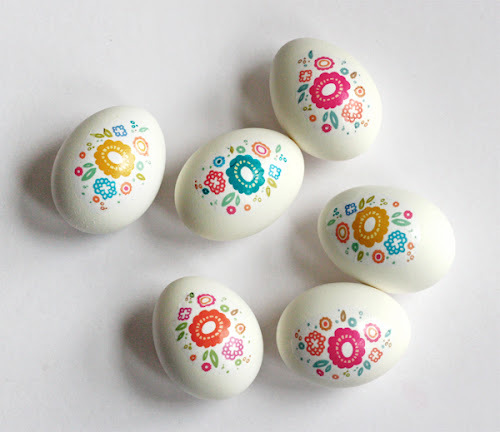 If you'd like to make some eggs like this, download the free sheet of decals. Print it on ink jet temporary tattoo paper and follow the application instructions on the package. It's super easy. 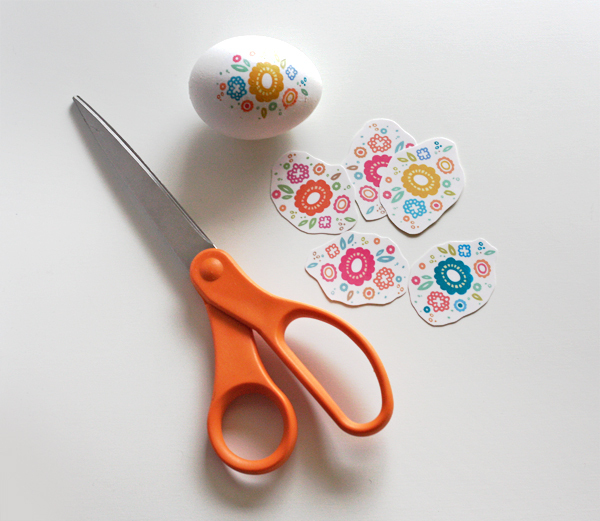 After the decals are prepared, just place a trimmed shape on an egg (or yourself), hold a wet cloth on it for 10 seconds, and pull off the paper backing. Smooth out any wrinkles with your finger. I used Silhouette brand tattoo paper purchased at my local PaperSource last year, but you can also get similar stuff from DecalPaper.com. I know somebody who'd love it if her auntie mailed her some tattoos! ;) They're very pretty! Mum, yes! I should make Courtney some tattoos. They could be anything! Hmm... if you have ideas of what she'd like, let me know. Of course you have Fiskars! 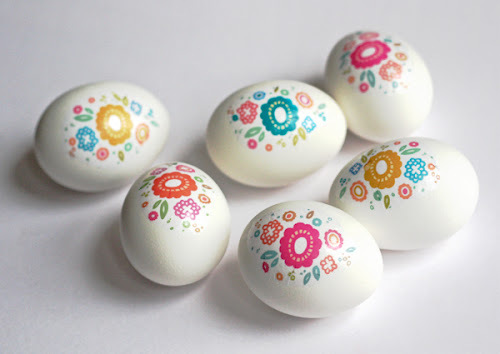 So very cute these egg tattoos. Do you have a Silhouette cutter, then? I am trying to justify buying one, but don't have a real clear idea of what I'd use it for. I do have a Silhouette cutter, but I've never used it with tattoo paper. Such pretty eggs! What a lovely idea! Every time I get a chance to read your blog, I come away with a new idea (like the fact that inkjet decal sheets even exist), and renewed energy to bring art and design into my kids lives. Thank you so much! Thank you! I just ordered some tattoo paper and am going to make these with my kids. I love your designs. What a clever idea. It seems so obvious NOW. Pretty pattern, too. You come up with some of the best things! Great idea and lovely flowers. I had never heard of "ink jet temporary tattoo paper". I'll check it out. Thank you! These are so cute! Your blog is the best! Perfect to combine flower with the egg. You choose right material too and that's look awesome. We're definitely doing tis next year! I love the vibrant colours but simple design...unfortunately we rarely get white eggs here in England and don't think it would look as good on brown eggs! I've just put together an "Easter Inspiration" post on my blog and included your photo (linked back, of course!) If you're not happy with me sharing your idea then let me know and I can amend the post!